It might be my favourite building in the world. 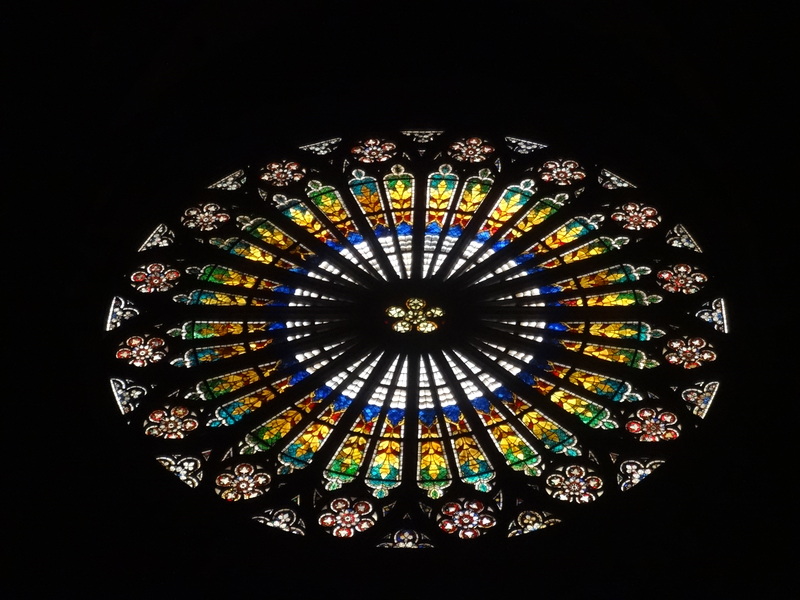 And this year, 2015, La Cathedrale de Notre Dame de Strasbourg is 1000 years old. The day I got back to London last month, I was looking for some drawing pins at my mum’s house when I happened upon an old badge that was mixed in with them. 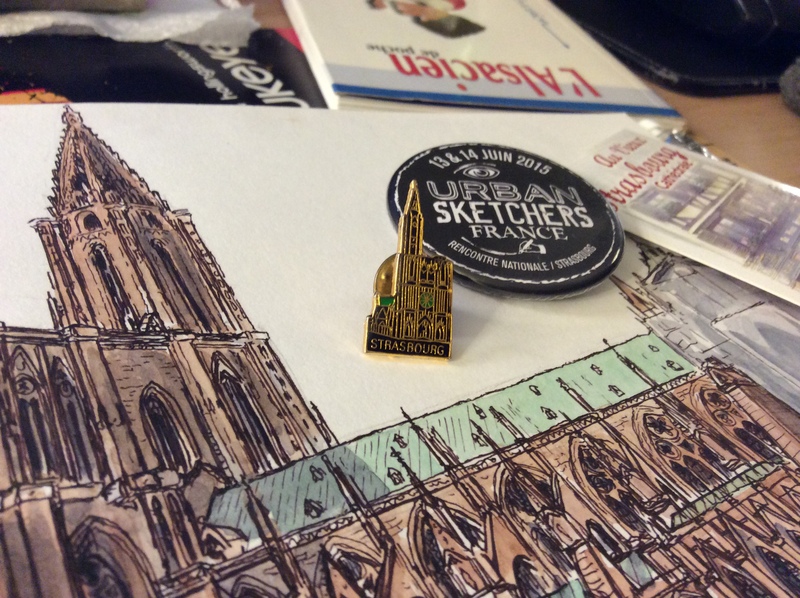 It was a small metal badge of Strasbourg Cathedral, which I must have bought on my first trip there, and has been sitting in a drawer at my mum’s for years and years. What a coincidence, as I was shortly going to go back there. 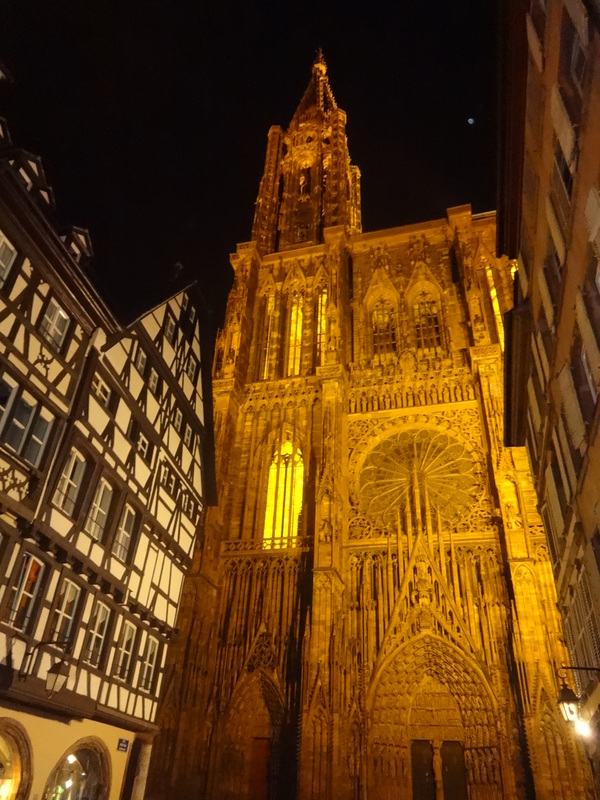 Strasbourg might have a European parliament building, and lots of pretty timber-framed buildings, but it is a city dominated by its massive cathedral. It sits in the centre of the Grand-Ile with its single solitary spire pointing high into the heavens. It can be seen for miles around. Locals told me that if ever I were lost, I should just look up and find the cathedral. Of course that only really helped if I were going toward the cathedral, so on this trip I booked a hotel right next to the thing (the Hotel Cathedrale, I recommend it). It was the scene above, the view down the tourist-trail of Rue Merciere, that I longed to sketch. I was stood almost in Place Gutenberg, where stands the statue of Johannes Gutenberg, who invented the printing press right here in Strasbourg. I stood there mid-afternoon, and because my hotel was just around the corner I took a break halfway through, and went back to do the rest. 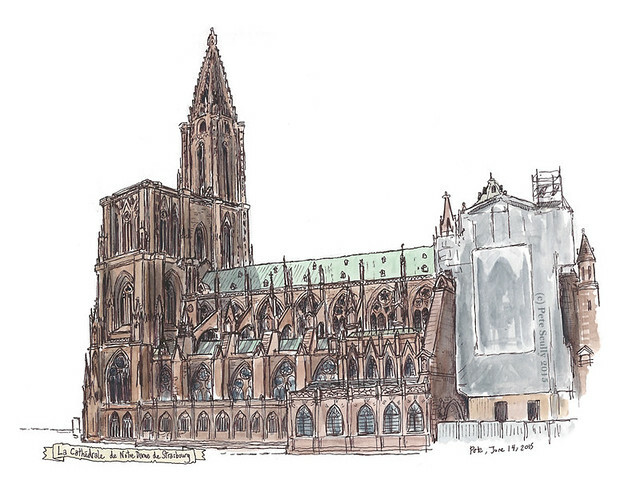 I had promised myself that I would sketch the cathedral at least three times, from three different angles, and so I did. I love this building. In 1997 I came to Strasbourg with my oldest friend Terry. We came on an overnight Eurolines coach (remember taking those, in the days before budget airlines? Yeah those days are thankfully gone). I remember that it was the day after Princess Diana died (it was funny, French people kept asking us how we were doing, all concerned like, and we were both like, um, we’re fine, thanks, not realizing all the national weeping nonsense going on back in England). As we approached Strasbourg, I could see the huge spire in the yellow dawn mist towering over the city, and it was an image that stuck with me, like an illustration from a fantasy novel. Its shape is so distinct. It looks like it is missing a spire, and in fact it is – the second steeple was supposed to be built, but was never constructed. I was told many stories about this cathedral, how for several centuries it was the tallest building in the world, how during the French Revolution the cathedral was covered up with a giant cap to save it from those revolutionaries who wished to tear it down. In the sketch above, you can see how the rear is also covered over, but this is just renovation, not revolution. I had a nice time sketching this one. 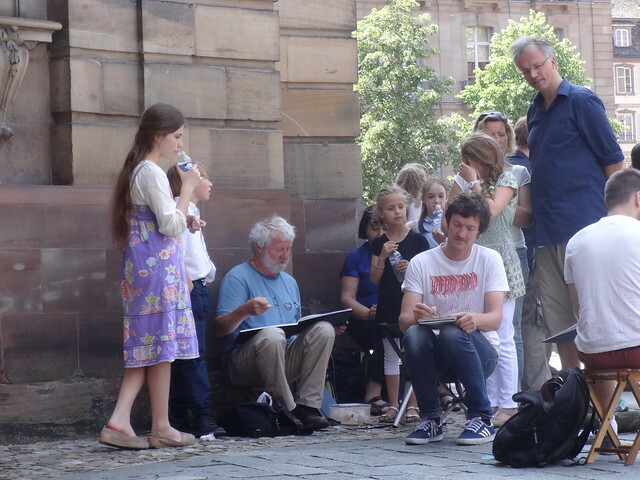 Several of the Belgian sketching group were there too; Gerard Michel (the cathedral expert, my inspiration) was gathering a crowd of onlookers. As I sketched, a group of young schoolchildren were gathered in the plaza (which was not as nice and open as this the last time I was here), and several times they sang La Marseillaise, which echoed off the grand building beautifully. As well it should – for as much as Strasbourg has been swapped between the French and German realms, that national anthem of France was actually composed not in Marseille, not in Paris, but right here in Strasbourg. The sketch above is the pre-breakfast early-morning drawing. My hotel being where it was, I just had to roll out of bed, grab the large sketchbook, and stand out in the Place de la Cathedrale before all the tourist shops opened. I said ‘bonjour’ to a few people holding machine guns, as you do. The cathedral is being well guarded by soldiers, walking about the building at all hours. It’s not a scene that I’m used to, but I’m not unfamiliar with in France (I remember years ago walking past a large cadre of soldiers on the Paris Metro, their fingers on the triggers of their automatic weapons), and it’s a reminder of the terrorist dangers that France has had to deal with this year. 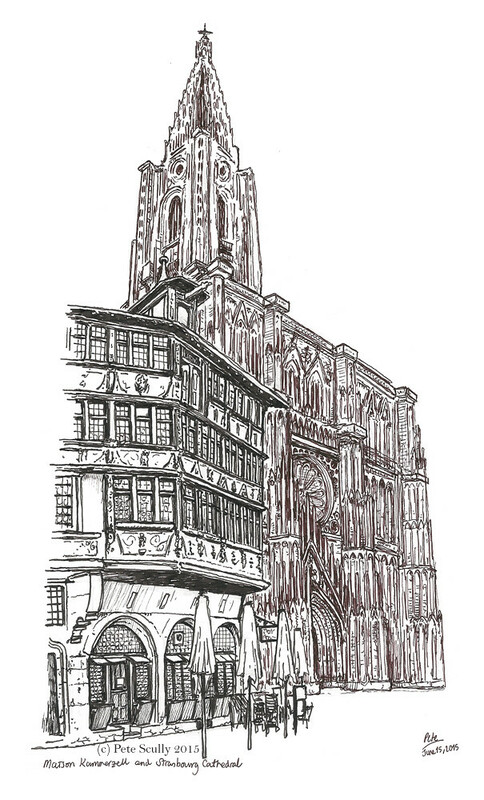 I stood next to the 15th century Maison Kammerzell, which I drew in the foreground in black ink, and drew the cathedral in brown-black ink. This is a famous shot. I started this at about 7:30am, but by 9:00am I was getting hungry so I stopped there, and went for a pain au chocolat at a boulangerie around the corner. It was such a delicious pain au chocolat that five minutes later I was back there asking for another. The woman in the bakery gave me such a dirty look when I came back and for a second one, as if to say “why didn’t you just buy two the first time?”. At least I got that much. On two other occasions that day (in FNAC and in Librairie Kleber), the shop assistant serving me barely acknowledged my existence other than holding out a hand for my money, looking away in another direction. But then I also had many occasions where I was helped by super friendly (and above all patient) people in shops and cafes. And so, the Cathedral celebrates its millennium this year. I didn’t realize this before I came to Strasbourg, so it was very good timing. Later this year they are having lots of celebrations and events. 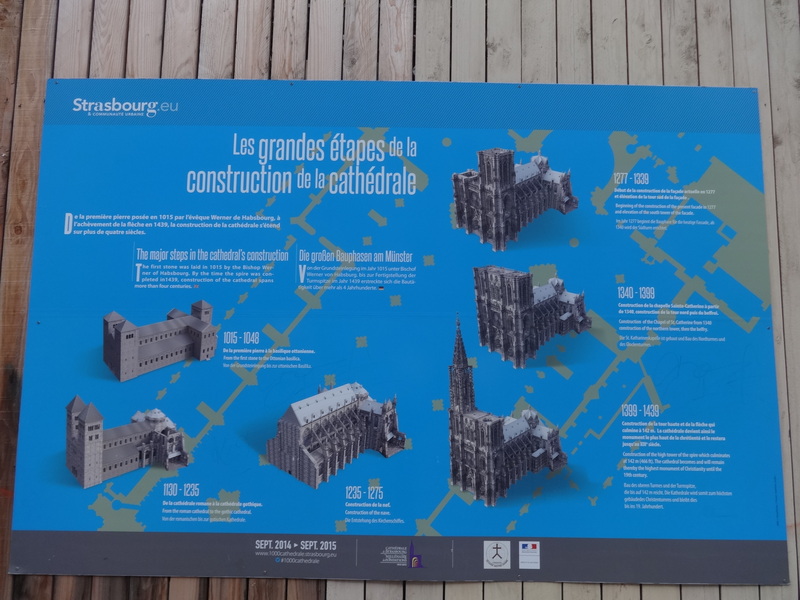 The picture below, taken from a display outside the cathedral, shows the history of its construction. As with most massive building projects in the middle ages, this took several centuries to complete. It stands at 142 metres tall (that’s 466 feet). It doesn’t sound like much when you put it like that. The first stone was laid by Bishop Werner von Habsburg in 1015. One of the most prominent architects involved was Erwin von Steinbach, who died in 1318, and the cathedral is one of the best examples of high Gothic architecture. Here’s that metal badge I bought twenty years ago (and found again last month), along with the USk France 2015 badge. Your sketches are fantastic as always. I’m very impressed with the cathedral art work. 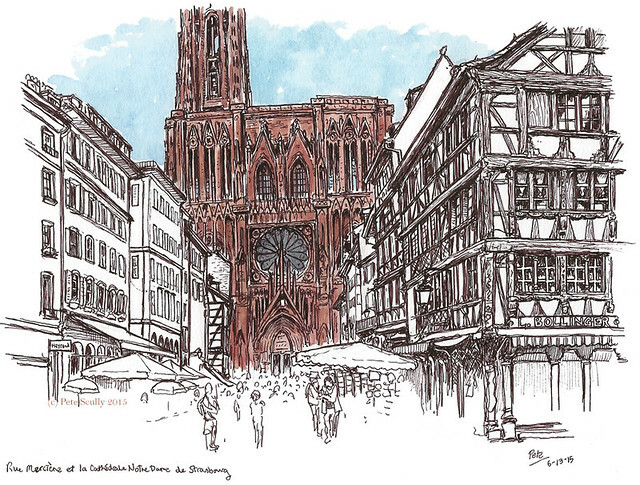 I’ve never been to Strasbourg but your drawings give me itchy feet to go see all that architecture and character for myself. Of course, now I no longer live in Britain, European travels are a bit more problematic. 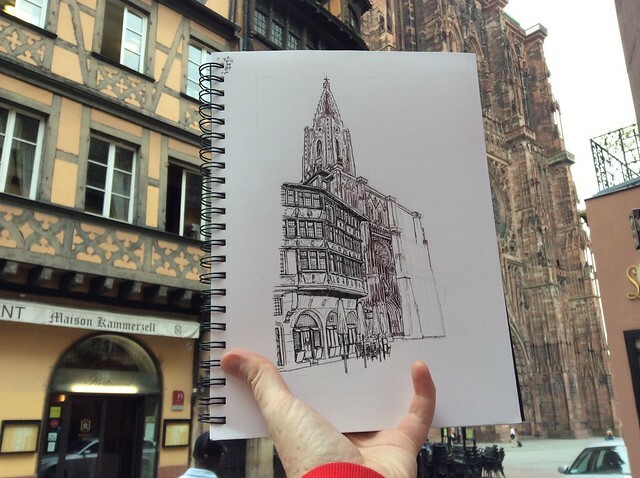 Strasbourg is brilliant, it really is. Yeah, living in America means I spend a lot more time longing for these old European cities which are now so much further away. I feel lucky to have been able to go to where I have gone over the past few years, but in the past this would have been a short hop away. Yup, the days of short, cheap flights and quick city breaks to European destinations are behind us both. Sigh. Love your sketches and commentary. I live in Tennessee (U.S.) and have fond memories of my nine-week trip to Europe 19 years ago. One of my favorite things to do in Italy and France was to enjoy coffee outside while enjoying the majestic architecture. This is one of the reasons I enjoy your blog. Cheers! Do you sell prints of your sketches? Thank you! I will browse the site. My favorite view is from Rue Mercière. It looks so imposing from there. Did you see the astronomical clock? That would be such a challenge to sketch! I love that view too (I have a photo of it as my screen saver at work), but my favourite is from next to the Maison Kammerzell, there’s something very fantasy-novel about how the cathedral appears and swallows everything up. I have it as my screen saver at home! It’s the Star Destroyer of cathedrals. It’s such a magnificent building. Yes, I did see the astronomical clock, surrounded by hordes of people of course. I thought about attempting it, but no way could I do it justice! Dont concentrate on the finger or you will miss all that heavenly glory. Bruce Lee — ‘Its like a finger pointing away to the moon.